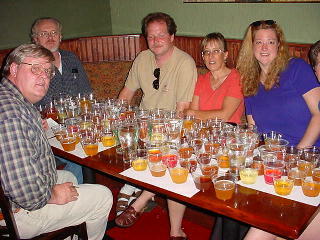 Owen Ogletree (director of Brewtopia Events) gathered together some of his fellow beer lovers in August of 2001 at Athens' Burntstone Brewhouse to sample and comment on several meads, spiced beers, fruit beers, ciders, and some interesting experimental styles. This beer sampling was done as a blind tasting where each style was revealed, but no one was aware of the brands that were being served. Beers were informally commented upon and ranked according to American Homebrewers Association (AHA) style guidelines. First, second, and third places (best of show) were awarded to the beers we felt represented their styles in extraordinary fashion. Drop Owen an email to share your comments and opinions. (L to R): Lari Cowgill, Bob Townsend (a food writer for the Atlanta Journal - Constitution), Mark King, Joanne Maki, and Kerri Allen (Owen Ogletree and Lynn Gieger are not pictured). We'd like to thank Burntstone Brewhouse for hosting us! A magical ale with an aroma of plums, toffee, and honey -- it smells wonderful. Flavor is of honey, hops, and malt. A very nice complexity is exhibited. There is a spicy tobacco-like flavor with hints of currant and alcohol. This is a warming, luxurious beverage. A beautiful beer with a natural dark color of blueberries. The aroma is perfect -- like fresh berries. The flavor is malty with some peppery character -- not a huge blueberry flavor. This is a great fruit beer because of its lack of overpowering sweetness. It could have a touch more berry in flavor. This is what a fruit beer should be -- rich and complex. This beer is loaded with strawberries in the flavor and aroma. It is darker than the apricot version and has a nice head of foam. The aroma is like strawberry jam, and the flavor has lots of body. The berry component is big, but somewhat balanced with the malt. There is not a great deal of syrupy character in the finish. A very flavorful, experimental style of fruit beer. This is a tasty beer with a natural, well-balanced ginger quality. It is crisp, refreshing, and well balanced. Very nice flavor with the ginger. There is good effervescence and a dry, ginger quality -- a well made beer. This is a very drinkable mead with overtones of muscadine and wild grapes in the aroma and flavor. There is some honey quality at the end, along with a warming flavor of alcohol. There is a sweet, nice mouthfeel. This would be a good winter, dessert wine. It is too out of balance with regard to the grape character to be a perfect sweet mead. This ale has a bit of skunk (light-struck) character in the aroma. The ginger and lemon character is intense, but not really pleasant. It smells astringent. The flavor is a bit watery and bitter (ale-like). It is not a very pleasant marriage of flavors. Should be more smooth and subtle. Color is bright red like a fruit soda. Smells like soda as well. One person said it has the aroma of a cherry popsicle. Flavor is very sweet and syrup like with a hint of artificial, candy character. There should be more apples in flavor and aroma. There should be better balance in the acidic character and the residual sweetness. Color is golden and the aroma is apricot with hints of citrus and a bit of interesting barn-like/horsey character common to some Belgian Lambics. The flavor is overwhelmingly apricot. It coats the throat upon swallowing, and there is a bit of tartness in the aftertaste. There is more apricot flavor than aroma. An interesting beer, but not well-balanced. The aroma is very light lemon. The flavor is like soda pop with lemon. There is a very mild flavor with lemon. This would appeal to people who don't really like beer. There is very little hop character and low to medium effervescence. Color is nice -- cloudy with a golden glow. Aroma is very true to style with good coriander and orange tones. Flavor is too bitter for style, and the beer is a bit dry. Bitterness could be from too many hops or from using orange peel that is too bitter. An interesting beer that is very drinkable but not right on style. Color is golden and nice and cloudy. Aroma is of clean honey and fruit. It smells refreshing. Flavor is of honey and wheat -- there is also a hint of citrus. This is dry and winey -- like a champagne with a full mouthfeel. There is a bit of lemon in the flavor and very nice head. This is a tasty beer with quite a bit of complexity -- one of the best of the tasting. Note: Just for fun, Kerri Allen's homebrewed Metheglin (sweet mead with spices) and spiced cider were including in this blind tasting. We must congratulate Kerri because both entries received great comments and the Metheglin actually scored just behind the first place Braggot in points!